To celebrate the 2010 Worldwide Pinhole Photography Day, I decided to reach out to two of the folks involved in organizing and evangelizing WPPD. Both Tom Miller and Gregg Kemp were gracious enough to answer a bunch of my questions and to share some of their own work with us. How long have you been involved in the Worldwide Pinhole Photography Day? Tom Miller: I participated in the first Worldwide Pinhole Photography Day in 2001 and contributed ideas to its press release. My involvement that year was embarrassingly minimal. The second year, the coordinators ask me to be the Event Coordinator, a new position I was honored to accept. I wrote a workshop guide, helped in the design of the event listings, and edited and approved the information on event submissions. To be honest, I wrote the workshop guide to help me teach a pinhole workshop for the first time. I still use the checklists in the guide when teaching workshops today. The third year I became coordinating team leader and have been in this role ever since. What role do you play in the organization? Tom Miller: I’m still the coordinating team leader, but that sounds more impressive than it really is. Over the years, the coordinators have become experts in their roles and in the annual cycle of Pinhole Day preparation and activity. The coordinators make team decisions. For the last few years, I’ve acted as the Events Coordinator as well. This gives me something genuine to do. WPPD events are all organized locally; the Pinhole Day website provides a venue for these organizations to list their events. I am continuously amazed and energized by the events that take place throughout the world. Many of the events have been taking place the entire ten-year history of Pinhole Day. Some are pretty enthusiastic, like the four Rotary clubs in Curitiba, Brazil that involved dozens of volunteers helping hundreds of children make a pinhole photograph. Richard Robinson’s “Lower Whitelands” project in 2004 and Justin Quinnell’s “bootiful footographs” made from shoes and boots are further examples. What prompted the creation of WPPD? Tom Miller: On February 14, 2001 Zernike Au, the creator of Zero Image pinhole cameras wished the old pinhole discussion listserv and Happy Valentine’s Day and wished that there could be a special day for pinhole photography. The idea “took” and a committee was rapidly formed to develop the first Worldwide Pinhole Photography Day on April 29, 2001. It amazes me whenever I think of it. The first Pinhole Day went from whim to reality in just two months, with a full-functioning bespoke website in several languages. Much of the credit goes to Gregg Kemp, the founding team leader and webmaster. Can you forecast how long the WPPD might last? We’ve seen the retirement of some long term magazines, lists and websites over the last few years – do you think that there is a waning interest or are you seeing more choices now. Tom Miller: Pinhole Day has been gaining in participation even since its inception. One big difference between Pinhole Day and the other venues that have gone away recently is that WPPD has a huge and spontaneous “other” focus; its energy is generated not so much by the website, but by the participation of schools, art groups and individuals throughout the world. Numerous art centers have had Pinhole Day workshops on their calendars for several years. Many classroom teachers have incorporated Pinhole Day into their curricula with new students taking part every year. New groups try Pinhole Day each year, and a few drop away. On the whole, though, it proves the viability of Pinhole Day as a wacky, carefree, educational and joyous celebration. Many times in our email conversations over the years, Gregg Kemp has mentioned that the true value of Pinhole Day lies not in the website, but in all the people across the globe that participate in local events. 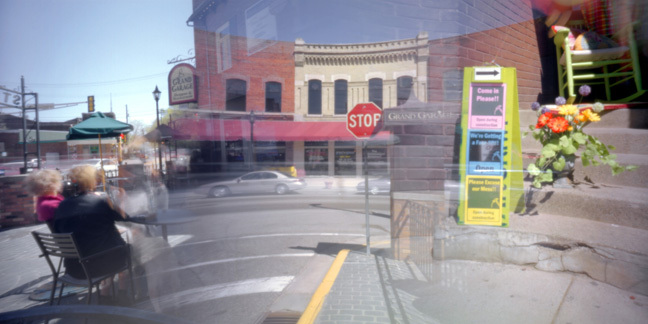 I’ve noticed this locally while conducting make-your-own-pinhole-photo events on Pinhole Day. At events where forty people will make an image, less than half will actually put their photo into the online gallery. All forty learned and enjoyed. I cannot speculate on how long WPPD will last. While the Pinholeday.org website is the hub of the celebration, it is the local groups that give it life. If our group of international volunteers can keep the website going, we could be around a long time. The freewill contributions that folks make to WPPD are used solely to pay for web hosting. When we started accepting donations a few years ago, we were able to restore early years’ galleries to the internet. What kind of growth have you seen since the beginning? Tom Miller: In 2001, there were 291 participants from 24 countries. In 2009, there were 3202 participants from 69 countries. Also in 2009, there were more than 160 events around WPPD, including exhibitions, workshops, classroom participation, lectures and just groups of people doing pinhole walkabouts. How much work is involved each year? Tom Miller: I don’t keep track of time spent on Pinhole Day, but it is probably in the low hundreds of hours per year. Most of the actual time spent by the coordinators is between Pinhole Day itself and the submission deadline of May 31. Do you all make a new site every year and do you curate the submissions, workshops etc or do you leave it open to anyone to submit? Tom Miller: We do not curate images in the traditional sense. The coordinators believe that the WPPD website is truly egalitarian with every participant and image equal to all others. Each submitted image is approved by a member of the coordinating team before it becomes part of the online exhibit. Our goal or ideal is to accept all submissions; but we do check each one to make sure it fits with the rules: the photo must be made with a lensless camera (pinhole, zone plate, slit, etc. ); only one photo per person per year, etc. I hope this is an understandable and non-technical answer to your first question: The website stays nearly the same from year. Each year in the Fall, a new events listing is created and the old one removed. And each year an additional gallery is created for the next year’s Big Day. Do you think that pinholing and lensless photography has grown since the proliferation of digital cameras? Tom Miller: This is a difficult question to answer, since I have only my personal perspective; but here goes. I do think that awareness of the pinhole technique may have increased because many digital cameras have a “pinhole” setting that makes a digital image look like a preconceived stereotype of a pinhole image: black and white, vignetted and fuzzy. This is an unfortunate disservice to the true practice of pinhole photography; it pigeonholes pinhole and results in digital practitioners missing the broad range of creative possibility that tiny aperture photography offers. There is also a common perception that pinhole is a counter-technology phenomenon. I don’t believe that this is the case for the majority of serious pinhole practitioners. 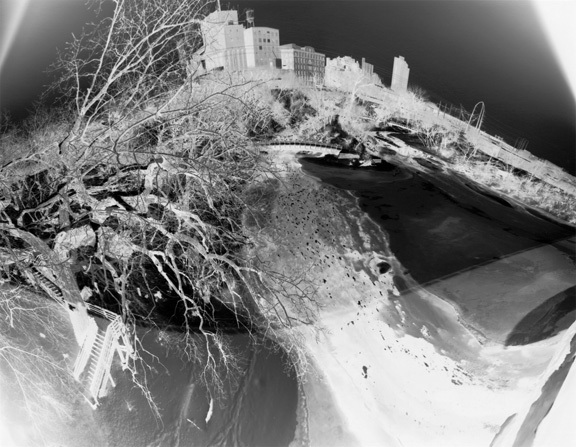 Pinhole photography and related techniques, such as zone plate and two-slit photography, offer a vast universe of creative potential, and these possibilities are much more than a reaction to digital technique. 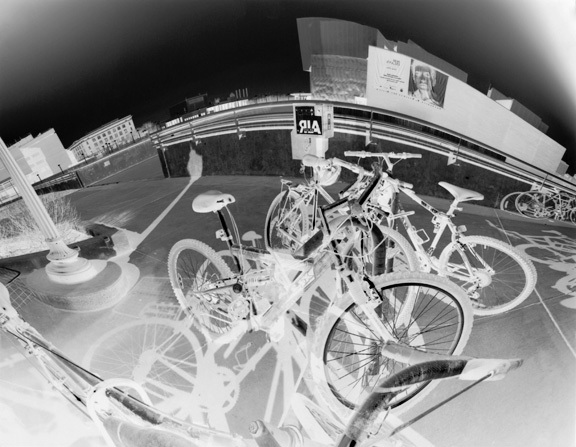 Many photographers, myself included, use pinhole capture in combination with digital output to achieve a creative vision. The biggest growth in pinhole photography happened ten or twelve or more years ago when pinhole photographers began to find each other via the internet. I made pinhole photos for several years before meeting another pinhole enthusiast. The original pinhole listserv was a wonderful social and informational exchange. What is your favorite subject to photograph with pinhole? Tom Miller: Goodness. I feel like such an old fart. My favorite subjects to photograph, certainly the most frequent, are landscapes and festive outdoor gatherings. The landscape work is primarily in older or historic areas and especially those close to rivers and waterways. Nearly all of my Dark Light photos are studies of human structures and life along the Mississippi and St. Croix rivers. Much of my Pinhole Blender work is done at ourdoor festivals. 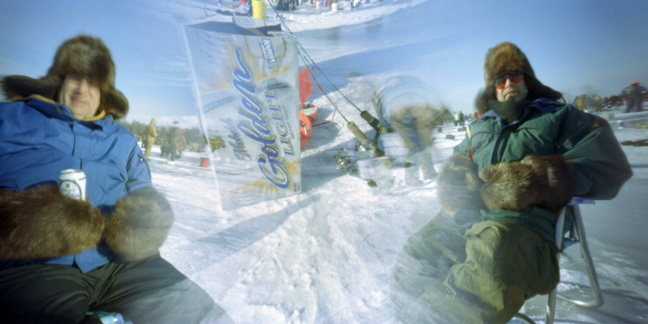 I’ve photographed the World’s Largest Ice Fishing Contest and the Art Shanty Project multiple times. I find that in these festive environments, a guy with a tin can on tripod is accepted a normal person, rather than a likely terrorist. People are so much more open at the festivals. I’ve had many pleasant conversations with them. In most of my work, I try to incorporate people (often they don’t know it) and text when possible. It adds to the humanity of the resulting scene. What camera(s) do you use? Do you make your own cameras? Tom Miller: My favorite cameras are tin cans. I have a set of ten potato chip tins. Each has been fitted with an electron microscope slide as an aperture and a magnet shutter; all cameras behave the same, which makes photographing much easier and the results more predictable. Each can holds an 11×14 sheet of photo paper perfectly. After using these cameras for while, I realized that I prefer the negatives to the contact-printed or digitally reversed positive. Now I make exposures with the intention of exhibiting them as a negative image. I call the series “Dark Light,” sort of a cheese title, but what the heck, it is true. The other camera I use most often is an original Pinhole Blender 120. On occasion, I still make the photographs that the camera was designed for: triple exposure montages that make a roughly 2 ¼ x 5 negative. Before the only local public access color darkroom shut out the public, I printed these photos using the traditional RA4 method. Recently I’ve been using the cameras to make film-long montages and printing them digitally on roll paper. A montage of 12 – 16 exposures will fit on one roll of 120. 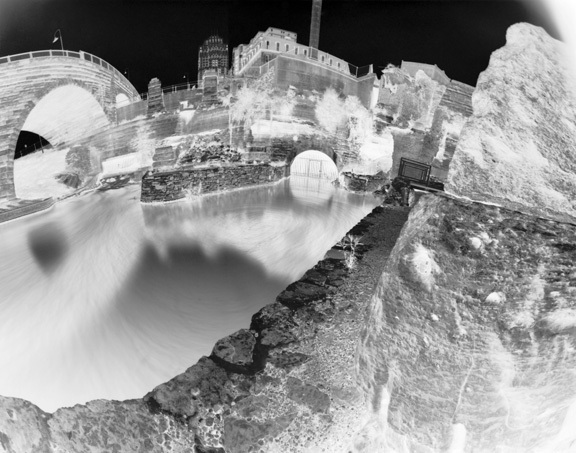 I also use what I call the “fake cirkut” technique, to create a lengthy panorama by using one pinhole and carefully advancing the film and rotating the stationary camera to achieve a multiple exposure image that looks like one long exposure, ala the old Cirkut cameras. What camera do you never leave home without. Tom Miller: The camera that is generally in the back of my car is a Zero Image 6×9. It is beautiful, well-made and easy to use camera, always at the ready. Tom Miller: There are a lot of them, and not all pinholers! Willie Anne Wright’s “Our Lady of the Nectarines” is the photo that inspired me to take up pinholing. I have great admiration for Eric Renner and Nancy Spencer’s work, both their individual work and their collaborations. Bethany de Forest and Ralph Howell’s projects are high up on my amazement list. Locally, Jeff Korte and Chris Faust have been inspirations. Among lens photographers, Henry Bosse, Clarence John Laughlin and O. Winston Link are inspirations. Bosse’s large-format cyanotypes of the Upper Mississippi are outstanding for their compositional balance while documenting the hand of man on the mighty river. Laughlin’s eye and mind are a fascinating and unique combination that I return to repeatedly. I find inspiration in Link’s photos because of his placement of subject against the black of night. It is similar to what I try to achieve in the Dark Light series. Tom Miller: Have fun!! And for goodness sake, don’t agonize about the proper pinhole size. Just start making cameras and photographs; be amazed and enjoy. Despite the popularity of digital camera and software enhanced techniques, keeping the traditional pinhole photography alive among enthusiasts is the call of the hour. I am glad to know that WPPD is being celebrated. The pinhole photos exhibits provide a great show window of photo artistry. 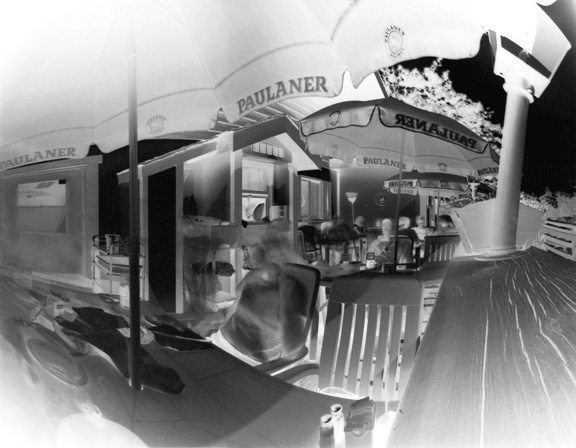 This website gives a chance for publishing pinhole photos, which I dearly appreciates. Keep up the good work. 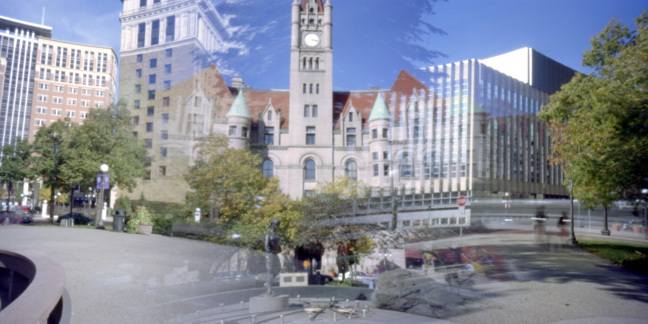 Tom Miller lives in the Twin Cities of Minnesota and is a long-time pinhole photographer. He often teaches pinhole workshops and events and has curated several exhibitions of pinhole and lens photography around the country. His photographs have been exhibited and published internationally. He has been the coordinating team leader for Worldwide Pinhole Photography Day since 2003.